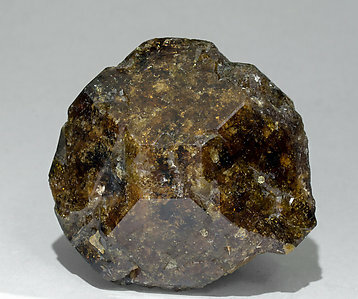 One of the scarce exceptional samples from the famous find of 2005 at the Jeffrey quarry, currently closed. 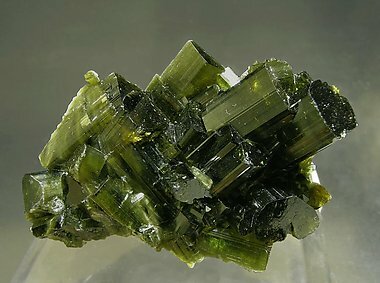 The Diopside crystals have an uncommon shape, being apparently tabular, but with fine vertical striations and the presence of the pinacoid show they really are very flat prisms. Their color and luster are excellent and the transparency extraordinary. 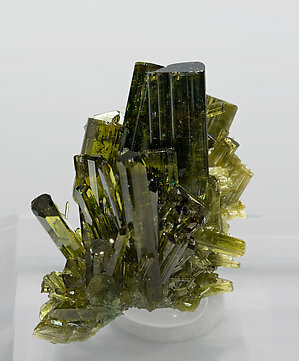 To all this we must add their association with prismatic greenish-yellow and violet Vesuvianite crystals. The specimen, as accompanying label shows, is of the 19th century. Crystal is a complete floater and doubly terminated, very transparent and having a darker color zone in one of the terminations. It is from the Steve Smale collection. 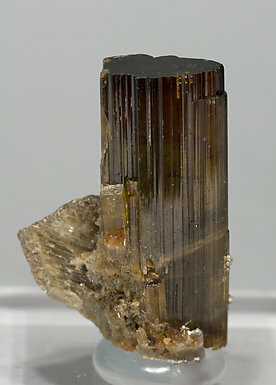 A single equidimensional Vesuvianite crystal of yellowish brown color. Its cubical aspect is due to two short prisms and a dipyramid plus the terminal pinacoid. 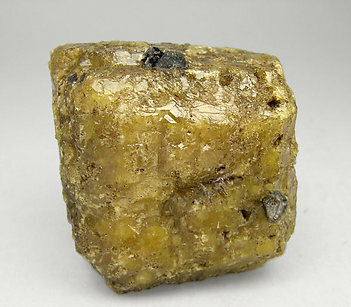 On the surface of some of its faces there are small groups of dodecahedral crystals of Grossular. 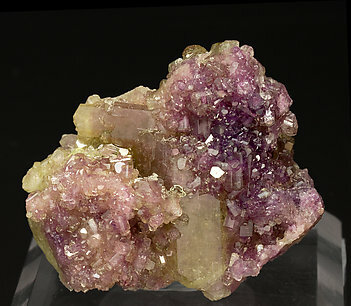 Floater sample with aggregates of short prismatic crystals, a lot of them doubly terminated, transparent, bright and with areas of a very vivid violet color on terminations. A small jewel. 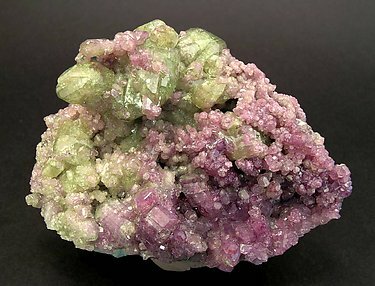 Floater aggregate of Vesuvianite crystals with very well defined faces and edges, a lot of them totally or partially doubly terminated, translucent, bright and with well differentiated color areas, between yellow and an intense violet. A Canadian classic. Fine and very beautiful miniature with prismatic crystals with sharp and very well defined faces and edges, and with excellent terminations. 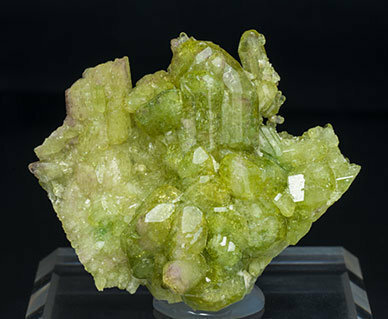 Very bright, some of the crystals are absolutely transparent and with excellent color, very deep and uniform. A classic miniature. From the collection of Tiziano Bonisoli, of Torino, whose label number 7539 we'll send to the buyer. Excellent miniature that forms an esthetic group of prismatic crystals, very well defined faces and edges, with a considerable transparency and a magnificent color. A classic. Very sharp floater crystal, bright and formed by a very sort prism, a much flattened dipyramid and the pinacoid. 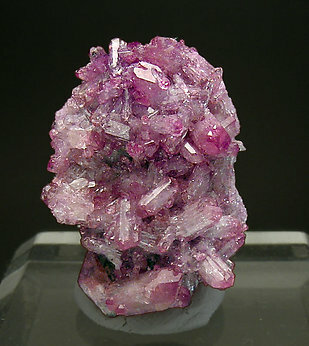 Nice miniature with a group of doubly terminated prismatic crystals, very bright and with an excellent violet color deeper on terminations. 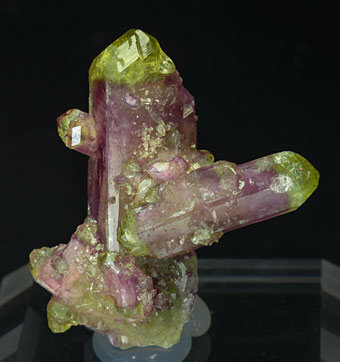 Groups of Vesuvianite crystals showing two well differentiated crystal generations; the first one with large yellow and transparent crystals, some of them doubly terminated, and the second, with small crystals with a very deep violet color. The sample is from the Silvane collection, whose label we’ll send to the buyer. 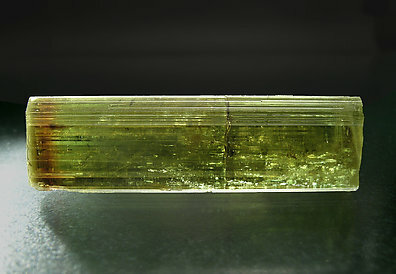 This particular specimen doesn't shows any color except green but it is doubly terminated, sharp, with huge crystal size, and the whole specimen is quite nice! 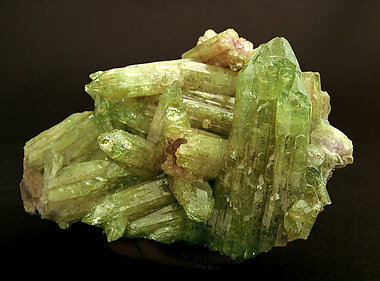 Aggregate of elongated crystals, one of them doubly terminated, bright, with very well defined faces and edges, with a greenish-yellow color and mauve colored phantom growths in the center of each crystal. 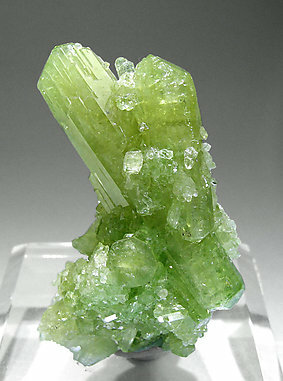 Samples of Vesuvianite from Asbestos of this quality are now very scarce since the reservoir is flooded. 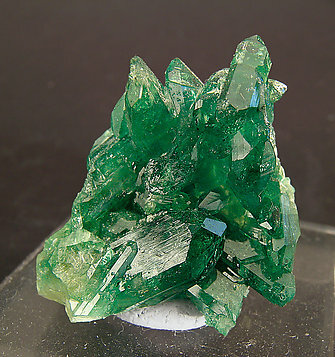 Group of crystals of very good color, very uniform, and excellent transparency. 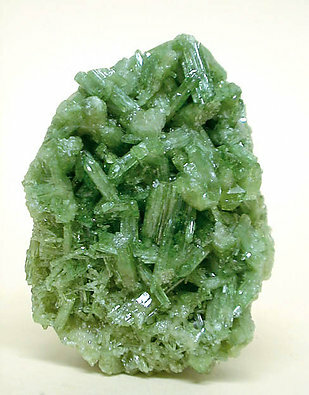 Furthermore, a lot of the crystals on the group are doubly terminated. A floater. 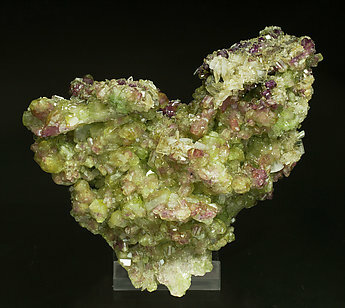 An especially attractive group in which coexist crystals of two very different colors, greenish-yellow and violet. 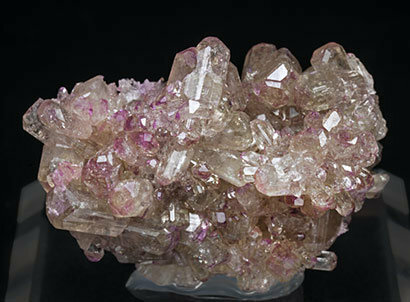 The crystals, most of them doubly terminated, are bright and perfectly defined. 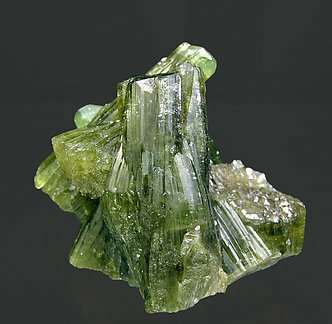 The crystals of this group, with an excellent color and exceptional brightness, are doubly terminated. The pyramid tips are, in addition, transparent. The specimen is a floater, with a recrystallized base. 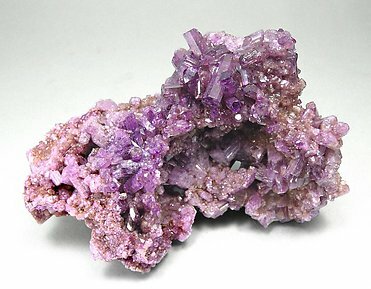 Group of thick crystals, forming polysynthetic aggregates with well defined lateral faces and terminations. 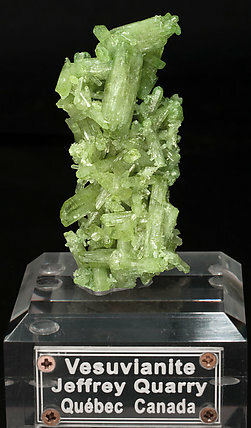 Crystal terminations show well defined light green color zonations. The other terminations are contacted but not fractured. Excellent and intense color. 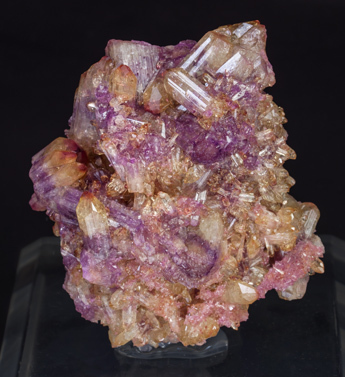 A splendid group of crystals formed by the prism and a very acute pyramid, with an excellent color and luster. In some places some mauve colors appear. Although they may look like breaks, they really are recrystallizations. Group of prismatic crystals with flat pinacoidal terminations. Many of them are doubly terminated. The luster is excellent and the color, very deep, is magnificent. 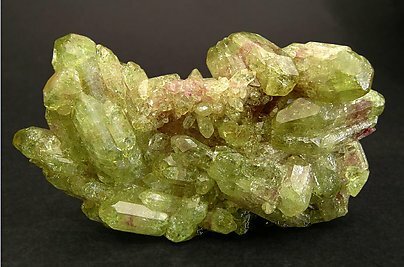 Aggregate of very well shaped Vesuvianite crystals, some of them partially doubly terminated, translucent, very bright and with a vivid greenish yellow color. 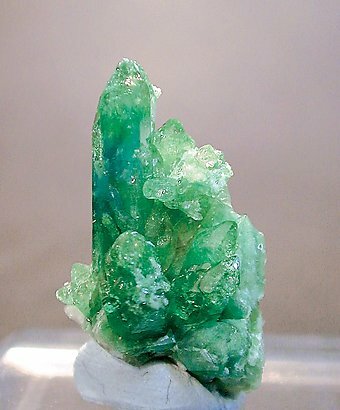 Very well defined, transparent and bright crystal with a perfect “mirror” pinacoidal termination and an unusual color zoning, deep green at the base and progressively changing to orange-red at the terminal zone. A sample from the Bonisoli collection, whose label we’ll send to the buyer. Group of sharp very well defined crystals. They are transparent, bright and have an excellent color that resembles the good samples from Asbestos. 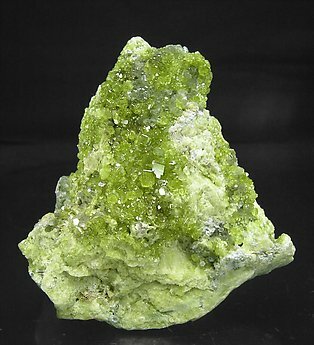 We specially note the locality in which specimens of Vesuvianite of such quality are very infrequent. 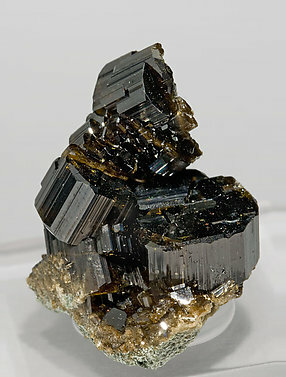 Group of short prismatic, almost tabular, crystals. They are translucent, very bright and of a yellowish brown color with greenish reflections. An Italian classic, collected in 1970, from the prestigious collection of Tiziano Bonisoli, whose label will be sent to the buyer of the piece.